Norway’s summer music festival season was reaching its crescendo this week. From “OverOslo” in June to the country’s largest festival “Øya,” which opens this week in Oslo, the festivals represent multi-million-kroner business but are also under pressure, from the high compensation demanded by performers to the neighbours who don’t like seeing their local parks and open space overtaken for days or even weeks on end. There’s also been a growing problem with ticket scalpers. “This year there’s been huge activity by scalpers, and direct swindles from private players or those acting like private players,” Jonas Prangerød, spokesman for the Øya festival, told newspaper Dagsavisen. Even though festival passes to Øya are sold out, at least 100 tickets are set aside and sold each day on a first-come, first-served basis, in an effort to combat the black market sales. Even Øya, which has attracted artists like Patti Smith, Arctic Monkeys, Kendrick Lamar and Charlotte Gainsbourg this year, is feeling pressure, though. “Higher artists’ fees and an unfortunate combination with a weak Norwegian krone took their toll on last year’s results,” Tord Krogtoft, the outgoing chief of the Øya festival, told Dagsavisen earlier this summer. The festival he’s nurtured for the past four years, and which has grown dramatically since it moved from the Middle Ages Park downtown to the park at Tøyen on Oslo’s east side, saw its profit plummet last year. Then there’s the pressure from people living in the Tøyen area. They’re tired of losing their local park for several weeks during the height of the outdoor summer season. There’s also a “Mini-Øya” festival for children earlier in the summer, and in addition to that weekend and the four-day run of Øya itself comes all the rigging up and down of stages and equipment. Plus all the crowds. Øya is expecting around 15,000 paying ticket holders plus more than 3,000 volunteers, staff and sponsor guests, every day. Øya is just one of the roughly 200 music festivals in Norway that received local- and state government subsidy last year. There are also scores of other festivals that bring both Norwegian and international stars to big and small places around the country. Music festivals in Norway are as popular as local beaches and ice cream in good weather, and have a long tradition. Their numbers have also grown in recent years. While the jazz festivals in Kongsberg and Molde have been around for years, new ones are springing up in all types of music. 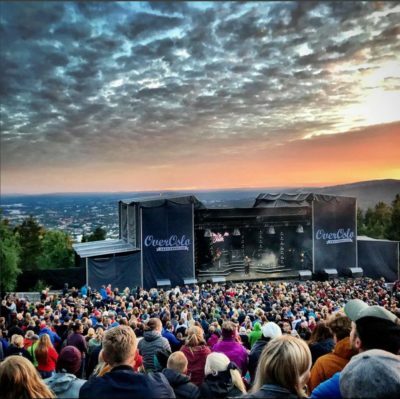 The relatively new OverOslo festival, held on the hilltop at Grensen with sweeping views over the city and fjord, sold out like Øya. The Vinjerock festival in the mountains of Jotunheimen is ranked as among Norway’s best, as is Palmesus along the beaches of Kristiansand, Bukta in a bay in Tromsø and Picnic i Parken on the grounds of the Vigeland Museum in Oslo. Norway can offer some stunning outdoor locations for festivals, especially all the small ones that have found a niche, like Riddu Riddu in Northern Norway, which concentrates on the music of indigenous peoples, and the Tønsberg Middle Ages Festival on old Viking grounds. Some sponsors fight for a place at the festivals, whose audiences represent a market worth around NOK 450 million. The sponsors want to promote their goods and services to the festival crowds, reported newspaper Dagens Næringsliv (DN) recently, while concert-goers seem to like their presence. “I don’t think our generation wants to be hounded,” 24-year-old Frida Hals told DN while attending the Stavernfestival in the historic coastal town of Stavern south of Oslo. “This form of marketing yields a more positive experience, and the brands here seem cool.” The Palmesus festival in Kristiansand raked in NOK 16 million in sponsor revenue this year, according to DN. 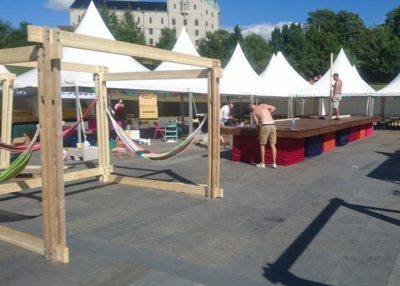 The festival business does cause disruption at their outdoor locations, though, and even urbane Oslo residents often breathe a sigh of relief when the City Hall Plaza returns to being an open, peaceful place after one of the many festivals held there packs up and leaves. Tøyen residents remain unhappy, however, that their neighborhood and park are being invaded by thousands once again. Demands that the City of Oslo renegotiate its latest five-year extension of the lease to the Øya festival went unheeded.